Are you in the Christmas spirit yet? What about your dolls? Well, maybe some decorations will help... perhaps even these that you can make yourself! This isn't just ANY craft! It's a craft collaboration with three other impressive crafts that came before this one! Check those out below if you haven't already read them! And of course, this collaboration is with the totally marvelous, fantastic, creative Madison! 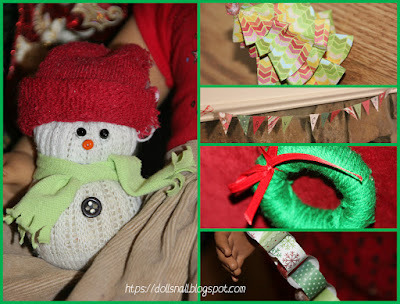 This week, I'm going to do more of a collection of a whole bunch of crafts that you can use to decorate! A few I just wanted to take a picture of that I had made before (or one of my siblings did) and leave a link with you to check those out! Begin by wrapping the green yarn around the Styrofoam ring. Soon you should have a green ring! Tie a red ribbon around the top. These instructions are kinda self-explanatory, eh? Next, fold a strand of green yarn in half and slip the folded end through the ring and back over to the top. Slid the two loose ends through the loop. Tie the loose ends into a loop to make a hanger. And tada, you have a Christmas wreath for your doll! I really liked this, because it's just super easy and cute! The first step is to mark and cut 14 squares of paper: 2 in. x 2 1/2 in. On the shorter side, mark 1 in. (the middle). Using the ruler, draw a diagonal line from the top corners to the middle mark, making a triangle. Soon you should have fourteen triangles drawn on the rectangles. Next, take the 1/2 inch and mark it as seen above. Now the pile should be of a whole bunch of colorful triangles! Trim the edges that show from behind. My favorite part, the writing! Using a marker or pen (with a pen you must outline it more than once), begin writing each letter on a separate triangle. Now, add glue to the fold over part. Laying the twine (I used macramé string) on the crease, fold it over. And there you have it, a pretty banner to string across their festive room (s)! This is just like any other paper chain, just tinier (and it takes a lot longer!)! Cut all the papers into tiny strips. Tape the first into a circle (end over end). Link another strip through the first circle and tape again. Continue repeating the process! Super easy and fun! And really pretty, if you have the patience! Isn't he adorable?! He's made out of a baby sock, with the toe trimmed of, turned inside out and rubberbanded the end. Then you fill the sock with rice and tie off the end with thread and decorate. My mom actually made this one and used the red toe to make a little cap! The eyes were made out of seed beads, the button is a button (duh! ), and the scarf is a scrap of cloth! Hi from Sam and the snowman! Next is a paper tree, made out of pleated circles that you slide onto a toothpick or skewer and top with a bead! You can make these with all sorts of colored paper! And thus concludes the crafts for this week! Make sure to check out Madison's tutorial next week, and look forward to another tutorial over here at Dolls N' All sometime later in next week! And on Christmas Eve, a day before the big Christmas surprise, I'll feature all the pictures in a big post! How fun! Which craft was your favorite? Oh my goodness these are so adorable!! I LOVE the banner- and the snowman- and the Christmas tree- oh it's hopeless to pick a favorite! :D Awesome crafts!! I had a lot of fun making these and next week's craft is even more fun (for me!) Thanks! *TV show announcer voice* And once again we have an amazing craft by the amazing... Light4theLord!! Oh my goodness, these are SO cute! I can't wait to make these! I'm going to make a photo story of my dolls decorating and I hope I have the stuff to make all of 'em! I think I can make the styrofoam ring myself out of this styrofoam thingy I have (we'll see how that turns out XD), but if not, any ideas on where I can buy one/where you got yours? *TV show announcer voice* And not only this, but this proceeds the very impressive crafts of the most esteemed Miss Madison Lorfing! Thanks! Oh, I can't wait to see it!!! Personally, I really dislike Styrofoam that crumbles like the one above (I wanted a really solid actual ring, not one with flat edges, but it worked anyways! ), but it was the only one I could find. I found it at Hobby Lobby, I think, when I went shopping (and if you go, look for some really cute mini stuff- it's everywhere! I wanted to buy out just about every doll sized thing!) I was wondering, should we send each other pictures of the crafts that we made (of the other person's), or do you have a different idea that might work better? You're welcome! I finally got the little fluffy foamy styrofoam-ish thing to work (it was hard, but I made cut the ring myself), and the wreath turned out pretty cute! I made the ornaments after searching for the perfect stickers in all of Walmart, and then I found a really cute pack so now the doll tree has your craft in it and I'm working on the ornaments (I got the felt already!). Seriously?! I didn't know that amazon did that! I hope none of our orders happen like that (yipes!)... I'm really sorry you didn't get it, but I'm sure the others will look great as well! I don't know if they have a Hobby Lobby or Michaels in FL where you live, but they have rows of really pretty paper and sometimes they have sales where it's only 22 cents per sheet! Cute! I think my favorite is the paper chain! Thanks! If you look closely, I didn't finish it all in one sitting because it took so long! Thanks! I actually got a pack of two, so I'm making one to give as a gift! Those cute are so cute ! Thank you! It was fun making them! I'm making them this year for my dolls! Thanks!